One way to give your home an instant face lift is to buy new wood doors Houston. Some people prefer wood to other materials because of its many advantages. Wooden doors feel more welcoming and inviting, making them perfect for entryways. It is easy to customize wood, too, by painting or staining it. Scratches to the surface of a wooden door are easy to repair. These are a few of the many reasons people opt for wooden doors. Finding the perfect exterior or interior doors in Houston can be tricky. Choosing the wrong style or color can ruin the look of a room or entryway. Many homeowners struggle with this decision because of its importance. There are a few tips that you can keep in mind. These suggestions might make selecting the perfect door much easier. As important as the decision is, it does not need to be complicated. Once you know how to choose the perfect wood entry door for your home, visit Southern Front. Southern Front Stained Glass and Doors has a wide selection of styles for you to view. Interested customers can see their products online at http://www.southernfront.com. If you do not find the door of your dreams, you can contact them to discuss custom options. Customers can call Southern Front at 291-890-5860. The first thing you or anyone else notices about your home is its entryway. For that reason, picking the perfect wood entry door for your home’s style is crucial. Your front door sets the tone for your entire house. Picking one that you love is as important as choosing a style that is attractive. You want your home to look beautiful to others and to you. Focus on your tastes and preferences when it comes to your home’s exterior. Exterior and entry doors receive a lot of wear and tear over their lifespans. The frequency with which they receive damage makes it important to pick durable materials. Some types of wood hold up to the elements better than others. The perfect type of wood for your home may depend on your climate and any environmental factors. Speak with your local vendor to ask about the perfect type of material for your area. Southern Front Stained Glass and Doors has a variety of exterior doors available. They can ship to customers across the U.S. and Canada. You can visit Southern Front online at http://www.southernfront.com/. Their entire product catalogue is online, along with other contact information. Prospective customers can call Southern Front at 291-890-5860 to learn more. As with exterior doors, shopping for interior doors in Houston can be challenging. Interior doors can change your impression of an entire room. This makes finding ones that suit your home’s style and decor very important. For many consumers, custom options are the best way to find the perfect door. When you browse for interior doors, try to find a company that offers custom solutions. You may find the perfect pre-made door, but it is always a good idea to give yourself as much choice as possible. Avoid selecting a door because it looks novel, and instead focus on the space the door will occupy. For example, a hinged door might make a small space seem even smaller. In situations like that, consider a pocket or bypass door instead. Mirrored bypass doors are perfect for closets in small bedrooms. It might be helpful to browse online while you are in the room you hope to renovate. This might make it easier to picture the door in that space. Southern Front has many interior wooden doors available. Customers can view their products online by visiting http://www.southernfront.com. Southern Front also offers custom interior doors. They want to be sure their customers leave with the perfect doors for their homes. Offering a wide selection and customized solutions helps them reach that goal. You can reach Southern Front online or by calling 291-890-5860. In cases were solid wood entry doors do not suit a home, there are other options. Homeowners should consider composite wood and fiberglass entry doors in Houston. Composite doors like these can add a lot of elegance to your entryway. They can also increase your home’s value and boost your curb appeal. Adding fiberglass to a wood door can make your entry way seem less dark. When shopping for wood and fiberglass doors, be sure to ask about their construction. Some disreputable companies will use cheap materials to boost their own profits. Once you find a composite door, be sure to ask about proper care and maintenance. You may need to keep special instructions in mind when cleaning the glass, for example. 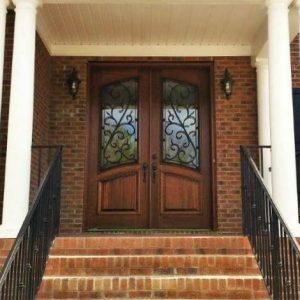 Southern Front is proud to offer their customers a wide selection of doors in a variety of materials. You can contact Southern Front Stained Glass and Doors by calling 291-890-5860. Interested customers can view their product catalogue online at http://www.southernfront.com. Southern Front ships to locations across the U.S. and Canada. They are the perfect place to find wood and fiberglass doors. Finding the perfect vendor is a lot easier than finding the perfect door. Look for a retailer that has affiliations with homebuilder’s associations. These affiliations mean the vendor supplies quality materials. You should also visit the retailer in person if possible or contact them on the phone. Southern Front Stained Glass and Doors is the best place to go for your doors. They have a wide selection from which to choose. You can view their catalogue online at http://www.southernfront.com/. Interested customers can also contact them by calling 291-890-5860. If you are looking for the best wood doors Houston, contact Southern Front today.